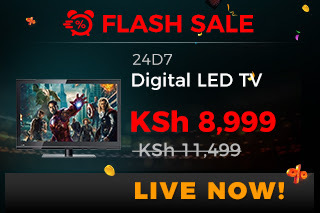 In this post we shall be highlighting all the Jumia Kenya Black Friday 2018 Flash Sales offers, deals and discounts. Bookmark to stay on top of this as the flash sales are time sensitive. 0.1.5 You need to grab this deal. For the next 2 hours, you get up to 43% discount on kitchen appliances. Among the items on flash sale this hour are a free standing 3 gas and one electric plate cooker going for just 19,990 shillings, a 4 gas oven for just 17,995, a single door refrigerator going for 18,990, a microwave oven, an electric ommelete maker and a non-stick gas stove. 0.1.11 Today’s black Friday promotion focuses on phones. All the flash sales will therefore be of phones. 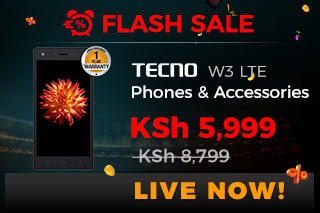 0.1.16 The latest flash sale is the Tecno W3 LTE going for just Ksh 5,999 down from Ksh 8,799. 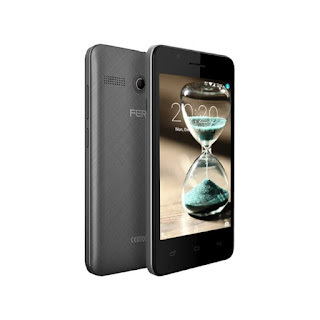 This is a 32% discount on this 5″ smartphone that is available in grey, retro red, gold and blue. Click on the banner below to take advantage of the offer. Limited Stock. 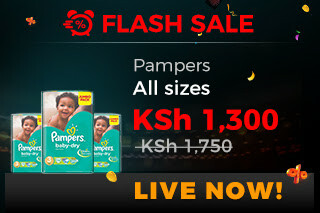 0.1.18 The pampers flash sale is currently live. Up to 29% Off. Hurry while stocks last. 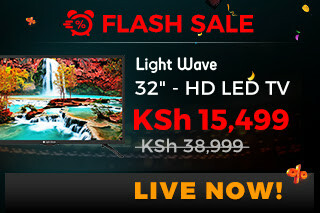 Here are today’s flash sales on Jumia Kenya. We are updating this post as the flash sales are made available. Tomorrow, we shall be having flash sales for TV brackets, abdominal toners, energy saving bulbs and Mosara cosmetics. Of course we’ll be here to give you all the details. Today is the actual Black Friday and the deals are hotter than they’ve been all year round. 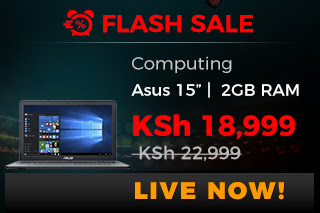 To start the day off is this amazing computing flash sale featuring an Asus 15″ laptop going at a 32% discount for Ksh. 18,999 down from Ksh. 28,000, a 15″ Lenovo laptop at a 33% discount going for Ksh. 29,999 down from Ksh. 45,000, a HP printer at a 35%discount, a Ksh 399 wireless mouse and 500GB toshiba external hard disc. The latest flash sale is that of a chest freezer going at a 33% discount and now trading for just 18,990 shillings and a double door fridge that is gong for just 19,990 shillings after a 25% discount. 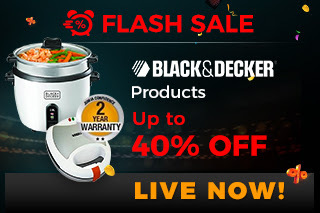 The latest flash sale features Black & Decker products. Up to 40% off on items such as sandwich makers, electric iron box and a non-stick rice cooker. There are also a few pieces of the Ksh. 12,990 free standing cooker. Click the banner below to see what’s remaining. You need to grab this deal. For the next 2 hours, you get up to 43% discount on kitchen appliances. 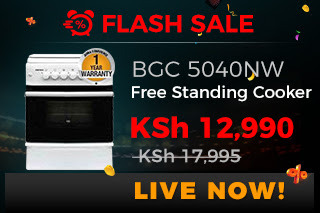 Among the items on flash sale this hour are a free standing 3 gas and one electric plate cooker going for just 19,990 shillings, a 4 gas oven for just 17,995, a single door refrigerator going for 18,990, a microwave oven, an electric ommelete maker and a non-stick gas stove. Today is all about fun Accessories. Today’s black Friday promotion focuses on phones. All the flash sales will therefore be of phones. The phone is going at a 35% discount right now. Only valid while stocks last so hurry. The phone is available in gold and grey and you can get it for the next few minutes at a 40% discount. Hurry before the next flash sale starts. The main focus of the Black Friday promotion today is Women’s beauty products. Treat the woman in your life or paper yourself without breaking a bank. 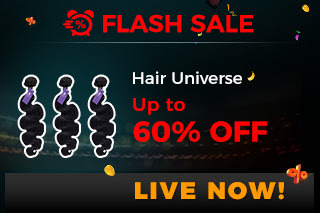 Click the banner below to see live flash sales. We shall keep you updated throughout the day. 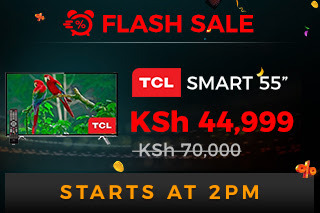 The next flash sale will take place at 2PM and this time you get to walk away with a 24″ SKYWORTH High Definition LED TV for Ksh. 8,999 down from Ksh. 11,499. As usual, stock is limited. You therefore have to be fast if you are to grab this offer. 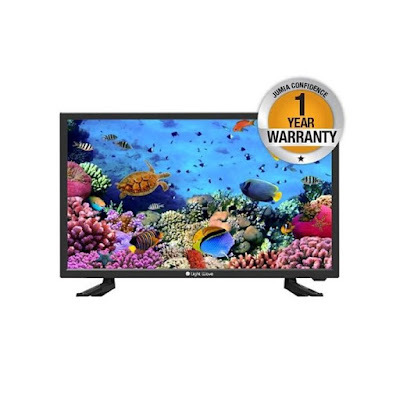 Click on the o view more details on this amazing deal. 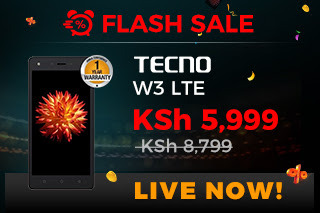 The latest flash sale is the Tecno W3 LTE going for just Ksh 5,999 down from Ksh 8,799. This is a 32% discount on this 5″ smartphone that is available in grey, retro red, gold and blue. Click on the banner below to take advantage of the offer. Limited Stock. The pampers flash sale is currently live. Up to 29% Off. Hurry while stocks last. 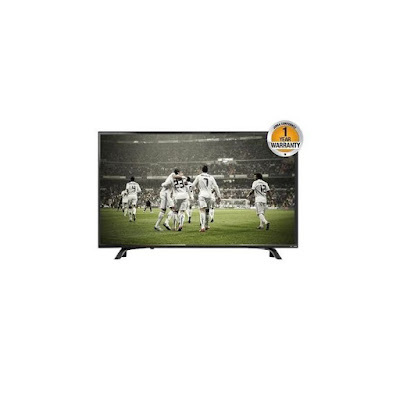 Get these two TVs for just KSh 15,499. Limited Stock; Hurry! 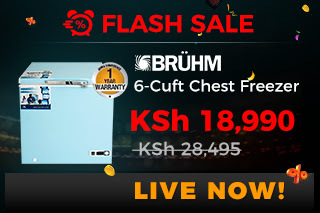 There’s no sale bigger in Kenya than Jumia Kenya Black Friday Week; and it’s no secret that Black Friday Flash Sale are the best that you’ll get all year round! 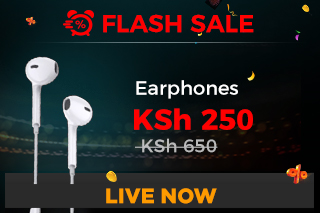 Every single day this Black Friday, Jumia kenya will be bring you several different Flash sales. I hope you’re excited for this month and the chance be one of the lucky people to walk away with one of Jumia Kenya Black Friday flash sale offers this 2017. 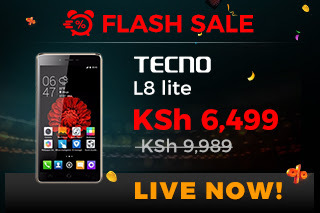 If last year and the one before that are anything to go by, Jumia flash sales are normally incredibly huge with up to 95%discounts. As is our tradition, we shall be highlighting the flash sale offers in this post throughout the Black Friday promotion period. Due to the insanely low prices and limited stock, the flash sales have been known to last for just a few seconds. You have to act very fast if you are to be one of the successful few. How then do you ensure that you are in the best position to take away a flash sale discount? The tips below will come in handy. Ensure that your phone and laptop are fully charged. We all know how KenyaPower and Lighting company let us down when we need them most. Low battery should not get between you and that phone or laptop that you’ve been saving for the last few months. Ensure that you have fast and reliable internet access. This is no time to start standing on a stool so your phone can pick an internet connection. Buy data on all your lines and plug in those cables. Chances are, the massive flow of traffic will slow things more than normal. This will save you time when it comes to buying. You want to be in a position to just ‘Add the Item to Cart’ and ‘Checkout’ in less than 5 seconds if possible. Ensure that while you register, you fill in and verify all your details and shipping address. This will save you the time it would otherwise take to make last minute changes. At the top right hand corner, hover over ‘Your Account’ as shown below and click on ‘Sign Up‘. Fill in your personal details and submit. On the right sidebar where you have ‘My Account’, click on ‘Address Book’ and then ‘Add A New Address’ as shown below. Done. You are now set. When it comes time to buy, all you’ll be required to do is click on ‘Buy Now’ on the item you need to buy and then proceed to checkout. 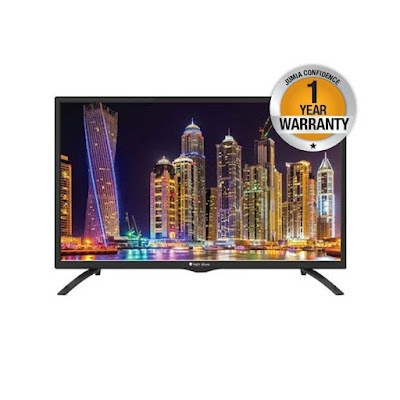 You can see the entire step by step procedure of ordering on Jumia Kenya by visiting this post on How to Place an Order on Jumia Kenya. See what is selling on a flash sale next and go to it’s page. Add to cart as soon as you can and immediately start checking out. Do not forget that we will keep you updated on the latest as far as Black Friday promotion on Jumia Kenya 2017 is concerned. Subscribe below to receive updates in your mail and bookmark this post to come back later. Happy holidays shopping and good luck. 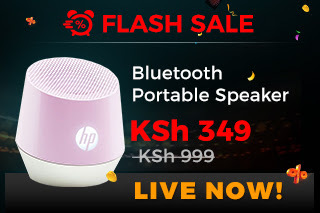 Jumia flash sales are great but they should add more products. The few they put up are normally sold out in minutes. When is this Black Friday thing? 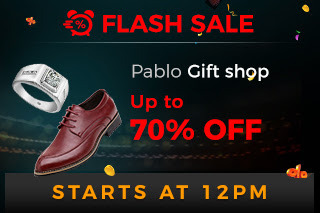 If you follow the steps I've given above, you stand a chance of being one of the first people to grab the flash sales. All the best.